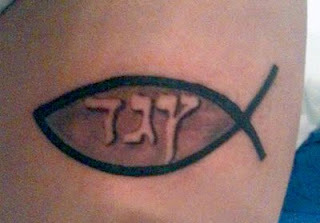 Today's victim wanted a Hebrew "Forgiven" tattoo, inside a fish. However, he was maliciously duped. Really, I just can't see any other explanation to this. Those are just random letters, and the word begins with a sofit. Fail? Totally. Now, boys, this is how you properly write "[was] Forgiven" in Hebrew. There are two words you could use, Nislach or Nimchal. Mind, this is the male version. I think you should link to the places where you take the tattoos from. It'll be interesting to see their responses. But other than that, it's a very nice site. I knew there is a site for bad Chinese tattoos, but didn't know people do the same mistake with Hebrew. The last two Hebrew letters in the tattoo may be an attempt at "dag" = fish, but reversed. It's anyone's guess what the Hebrew letter Tsade is there for. This is a reveresed Dag (דג) - a fish in Hebrew. As for the Tsade Sofit - on the hebrew keyboard the key for ץ is the same key for the period (.) when the keyboard is in English mode. I was doing research and this is very hard to find a good answer on the word forgiven. I've seen it at least 6 different ways. I have found this נמחלתי to be the most common one I've found. but you say this is for a female! I'm a male, good thing I found this site, lol I wouldn't want to be on it. Curious, what does the first symbol mean right infront of the ת? Actually, your word, "Nimchalti", is very good. It means "I was forgiven", and can be used by either guy or girl. The last two letters תי tell that it is "I" who was forgiven. Wow thank you! So if I were to get the tattoo going down my tricept (shoulder to elbow) would you recommend I just turn it to the right? Or keep it right side up and have it go down. What I'm trying to ask is if it'll change the word or make it read wrong? You're very knowledgeable! The best would be to turn it anti-clockwise (so the right side of the word is on top). You could also have it go down, but there's more room for error with that option. would be the correct way going down? would the last 2 letters meaning "I" need to be written as one? Yep, it should be exactly the way you wrote it now! Each letter by itself. So If im a girl and I want the word "forgiven", not the meaning of to forgive but closer to being forgiven, what is best? this is an old post - but I do have to tag along and say that "נמחלתי" more accurately translates to "absolved" than it does to "forgiven". Just putting it out there. Idk if anyone will be on this, but how would I put "I am forgiven" from a male perspective? Thanks, and God bless. What is the proper way of writing "forgive" as an active word in hebrew?